District Map. . HD Wallpaper and background images in the The Hunger Games club tagged: the hunger games map district map. This The Hunger Games fan art contains ڈاؤن لوڈ ہونے والے, مزاحیہ کتاب, منگا, کارٹون, ہالی ووڈ, and کامک بُک. Cool, where'd you get this? Its really good, but I think District 4 needs to be where 11 is though and why do the districts not go above the Canadian-USA border? Uh...why is District 4 landlocked and District 11 by the ocean? I always get confused by these. I know it says that there was flooding but why does everyone flood the sierra-nevadas? That is a huge mountain range and if the water made it past those mountains than the appalchias are certainly underwater too, which they aren't in the books. 11 should be where 4 is, so i'd be in 11 if it was there. Otherwise I'd be in four. Switch eleven and four and I thought the capital was where one is? I'm in District 9 on this map. *Spoiler* Before in the HG: Yeah! I'm in district 12! Now: Oh wait. All I know is the Capitol is in the Rockies (Found in the the guide to the HG) and District 11 is where District 4 should be. cool map... but finnick and i both agree that district 4 and district 11 could swap places and that district 12 is more in the ohio-west virginia range...but that is a really good map!!! district 11 is supposed to be the largest district in this map district 2 is the largest. too all you people who say district 4 is landlocked IT IS BESIDE THE GREAT LAKES GET A BRAIN! 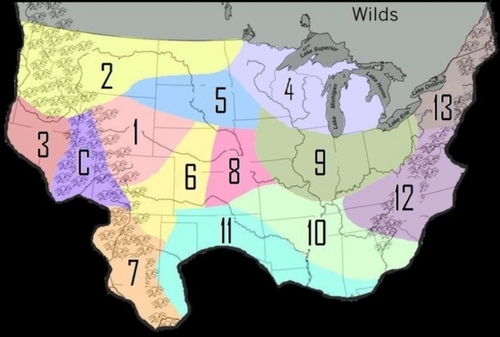 and the Panem is supposed to be in ALL OF NORTH AMERICA! not just the U.S.A. I'd be District 9, where you make medicine. -.-"
awesome map, really cool concept!